Synopsis: The TARDIS comes to ground in ancient Rome and is rendered powerless, stranding Ori and the Doctor in a landscape of disturbing anachronisms. They escape from a sealed tomb to find the skyline of the imperial capital broken by the startling shapes of smokestacks and electrical towers, and a majestic airship looms above the Colosseum. The so-called Romano-Egyptian Dominion is in the throes of an age of rapid and dangerous transformation, all thanks to the prophecy and divine guidance granted by a mysterious oracle. Unravelling the origin of this demented alternate history, the wayward travellers become embroiled in a dangerous game of politics and deceit, a contest that pits brother against brother against sister as the children of Cleopatra—Cleopatra Selene, Alexander Helios, and Ptolemy Caesar—compete for control of an empire on the verge of developing weapons capable of destroying their world. Convincing the triumvirate to trust the Doctor won’t be easy, for he has been afflicted by dangerous transformations of his own and grows more unstable with each moment spent in this twisted timeline. In unexpected bursts of elemental energy, the Doctor is regenerating, regressing through past incarnations! 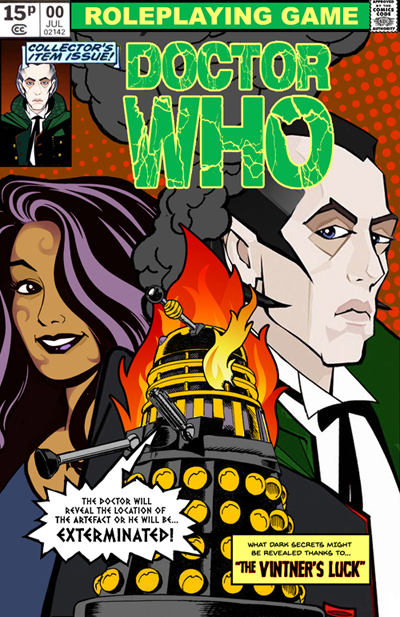 As the Time Lord is transformed from wide-eyed bohemian to whimsical tramp to crotchety old man, an overwhelmed Ori comes to see that no one is as they seem, least of all Cleopatra Selene, for behind the guise of this wicked queen schemes one of the Doctor’s oldest and most unpredictable enemies. 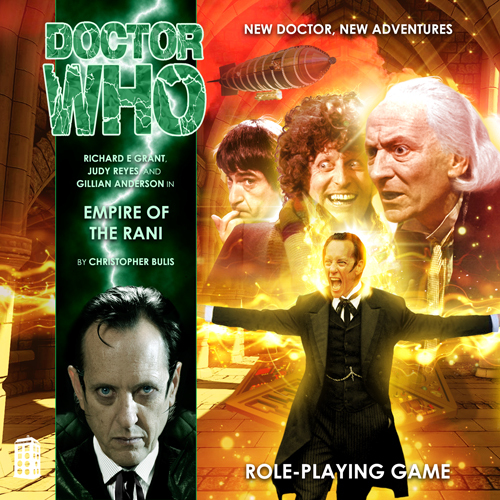 The earthbound Rani has been waiting for the Doctor to return to the era of the Roman Empire, and she intends to make the most of her revenge! Ori heard the shot rather than saw it. Her eyes were locked on the open doors of the Doctor’s escape pod, their one hope of survival. As the seething energy shot through the venting atmosphere of the cargo bay, the vintner threw herself through the battered blue doors—and landed face first with a blow that abruptly knocked the wind from her. For a moment, as Ori gasped for breath, she could hear only the deafening rush of the venting atmosphere. Then she heard the clack of the doors being shut behind her and all was quiet. In that instant, she somehow knew—she felt, deep in her being—that she was safe. The air was different here. The cargo bay of the Dionysus had been cold and stale. The atmosphere in the escape pod was warm and comforting, like a familiar old pub. For a moment, she even thought she’d caught a whiff of tobacco smoke, though she dismissed this as ridiculous. Continuity: The first adventure featuring Ori. Synopsis: Orizrekit’Gehm knows wine. Hailing from the ocean world of Adrilia, the seasoned vintner is heir to the renowned Gehm family winery, and a lifetime of cultivation has earned her a prestigious position as chief winemaker and sommelier aboard the famed luxury starliner Dionysus. Ori is a particular kind of connoisseur and so, she recognizes, is the strange, pale-faced passenger they call the Doctor. He strolls the liner’s self-contained vineyards as if he owns them, and his knowledge of variety and vintage is seemingly boundless. Ori is intrigued by this unusual man and, in a bid to impress him, she ventures into the depths of the Dionysus wine cellars to retrieve a rare bottle of Taurasi 178. Instead, she finds a raving metal monster that threatens her with extermination! In the fire and chaos that follow, she learns the truth about this stimulating stranger. The Doctor is experienced and discerning, a veritable virtuoso, but danger follows in his footsteps, and adrenaline is the vintage he knows best. ORI BREATHED in deeply. On the gentle breeze, she recognized the delicate fragrance of three distinct varieties of grapes. She let out a small sigh, knowing that in this part of the vineyard, she should be able to detect the kasis fruit as well. She closed her eyes and inhaled again, shutting out the bright afternoon. And then it was there—on the edge of her senses—slightly sour and wholly delicious. Relief washing over her, she opened her eyes again and smiled. Sometimes she worried that this artificial environment would start dulling her senses, but the sunshine and the wind that felt so real to the tourists aboard the Dionysus could never trick her acute perception. Reaching out to the closest vine, she bent down and rubbed the leaves between her fingers and inspected the fruit closely. She glanced down the row of vines to her left and to her right, then buried her face in the bunch of grapes and inhaled.